Three days before Henrik was born in late February, an article appeared in Norway’s Aftenposten newspaper; the headline read Norsk uskikk at spedbarn skal sove ute. 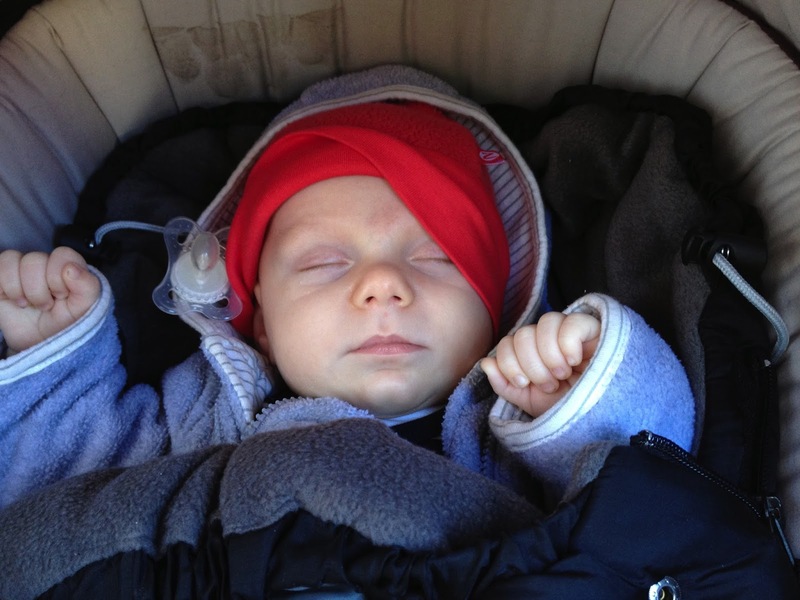 The Norwegian bad habit that newborns should sleep outside. It was a well-timed article, as I was well aware of the Norwegian, or perhaps more accurately the Scandinavian habit (as an article with similar theme appeared on the BBC around that same time about babies in Sweden) of babies taking their daily naps outside in their strollers, no matter what the weather. Outside? you ask. But isn't it cold in Norway, like, 11 and a half months out of the year? Why yes, it is, but that doesn't seem to stop anyone. In fact, there are written recommendations from pediatric health offices stating that it is acceptable for babies to sleep outside until it is -10C (or 14F)! Napping out in a stroller, bundled up in layers of wool and downy sleeping bags, is one of the few Norwegian habits that Greta did not adapt particularly well to upon our move here when she was 2. 5 years old and she began at the barnehage. It was too different and she was too curious—she kept peeking out of the stroller to see what the other kids were doing. Greta was a Champion Napper until this point, and we felt like had really gotten the nap thing nailed first time around. Naturally, I was both a little resistant and, I admit, defensive, against the thought of having to a) adjust my parenting habits which had served us quite well with baby #1 and b) make me and my baby somehow more “Norwegian”. Uhh, Emily? you say. There is no one forcing you to have Henrik sleep outside. The worst that could happen is that the Norwegian Nap Police won't come and award you with Integrated Foreign Mother of the Year, right? True, but. . . that's a really cool award! Seriously, though. . . once Henrik begins barnehage, which he will likely do around one year of age, he will be taking his naps outside in his stroller with all the other one-year olds. So, there is an incentive to train him to sleep outside now when he is young, otherwise it could be difficult once he is older. We had even bought a new stroller for baby #2 that could better accommodate a napping child because we knew this child would be napping outdoors. But appearance of this article just days before Henrik’s birth only added to my mixed feelings on the subject, and also justified some of my resistance. The article quoted a number of Norwegian parents and barnehage employees who talk about how healthy it is and how soundly babies sleep outside. “It has never occurred to me that it was anything other than healthy than to sleep outside,” said one mother. “The fresh air is healthy. And she likes her stroller,” said another. But apparently a number of utenlandsk (foreign) parents are asking the doctors and barnehage leaders why it is so healthy to sleep outside, and in this article Norwegian pediatric leaders are admitting, yeah. . . we actually don’t have any studies proving this is more healthy than sleeping indoors. One doctor in particular was “very skeptical” that babies should sleep out, especially in the cold. “I think it’s an odd Norwegian habit, or actually bad habit, that infants should sleep outside, even in the winter.” He continues and says he gave a talk in Buenos Aires several years ago and told that a “certain percent” of Norwegian SIDS deaths happen while the babies sleep in their stollers in the winter. While alarming, this did not come as a surprise to me, and in fact confirmed a concern that I have had, as Norwegians are very fond of piling puffy dyner – down comforters—on and around their sleeping infants in the stroller, very much against all the anti-SIDS recommendations we have in the US. It is not uncommon to see babies buried under a thick down comforter even in the middle of the summer. Unfortunately, the article did not pursue this point at all, which I found very frustrating, since the SIDS rate is something that I have wondered about. Instead the doctor continued that the bad habit must be a kind of misdirected belief in “hardening” or toughening up the babies by breathing in cold air, but that there really isn’t any research or studies to back up any of these long-held beliefs. One barnehage leader was questioned by a foreign parent about the whys of outside naps, she responded that there is less danger for spreading infection between the children when they are all sleeping outside (again—not documented or studied, just a “belief”). But a belief that I can see some truth in. Interestingly enough, the sleeping outside habit is so well institutionalized in Norwegian culture that there probably aren’t any barnehages that could accommodate all of their infant and toddlers sleeping inside—the barnehages are simply not built with that need in mind. And at first, they seemed rather surprised: where does your baby nap if not in its stroller? What do you dress them in if not wool? Seriously! And not surprisingly, the answers were basically what I expected: dress them in wool (ahh Norwegians and their love of wool) and the sound advice of check to see if they are warm. Duh. The helsesøster laughed, “Did that help?” she asked. Not exactly, but at least I felt like I wasn’t doing anything wrong. So, don’t leave me in suspense, you say. Where does Henrik take his naps? 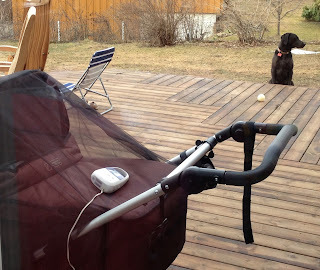 As the weather warmed this spring, I became more comfortable with leaving him on our porch in his buggy after a walk and allowing him to finish off a nap, with a baby monitor in the side pocket, within full view of my kitchen and living room window, and safely in our back yard. It wasn’t until about 6 weeks ago, in a moment of this-kid-won’t-stay-asleep-and-he’s-driving-me-crazy frustration, that I tossed him into his buggy where he laid calmly and quietly awake for half an hour, then put himself to sleep and proceeded to sleep for another hour and a half. Later that afternoon, I started his nap in the buggy. He slept for 3 hours. He’s been sleeping outside ever since.